A flurry of dealmaking in 2015 has set merger and acquisition activity on pace to surpass last year’s all-time record $1.5 trillion in transaction valuation with a potential year-end tally of closed deals valued at $1.7 trillion, according to a new research report by PitchBook. What the fourth quarter holds is still unknown, but the market should see at least $145 billion in total deal value for the period, and could match the $323 billion seen in the first quarter of 2014, according to projections by PitchBook, a financial data provider. That will add to the frenzy of deals valued at more than $1.4 billion closed in the first three quarters of the year. “We’re seeing some really massive deals. Hitting $1.7 trillion is very probable,” said PitchBook analyst Garrett Black. Prior to last year’s record, the highest annual tally for M&A action was seen in 2007 with $1.4 billion in deals, Black said. Still, quarterly comparisons show M&A activity starting to slide, due in part to elevated price levels, a slowdown in Chinese growth and other factors, making it hard to determine if the 2015 numbers will mark a peak, according to the PitchBook report. Notably, the third quarter logged $437 billion in 4,494 completed M&A transactions, down from $526 billion across more than 5,000 deals in the first quarter. Black said a slide should be a gentle one. Corporate buyers are dominating the dealmaking, making up 74 percent of all M&A flow in the third quarter, in line with the upper end of historical levels, and indicative of a “strategic appetite” to use cash and other financing to seek out growth, the report found. Of particular note, median deal sizes are up, and valuation multiples remain elevated with the median third quarter valuation-to-EBITDA multiple a high 8.5x, greater than any quarter since the start of 2010, PitchBook found. Still, underscoring what 2016 might hold, private equity dealings have slowed notably, according to the report, as worries about the U.S. and global economies, interest rate adjustments, and other factors spur caution. And as caution grows, some see valuation expectations by many in the middle market and lower middle market as higher than they should be. But Black said multiples are likely to move down into the 7x range in 2016. Many business owners are looking for multiples that are hard to justify, said Astrid Soto, vice president and head of business development for AUA Private Equity Partners in New York. Soto said her firm finds consumer-oriented businesses attractive now. Among AUA’s recent investments is a deal to fund expansion of the Florida-based restaurant chain Tijuana Flats at a multiple Soto pegged at between 5-7x, and an investment at a similar multiple in Illinois-based Raymundo’s Food Group, a maker of refrigerated snacks and desserts. Businesses that cater to consumers, the B2C sector, led third quarter M&A activity with close to $131 billion invested across 1,001 deals, PitchBook research found. As consumer spending strengthens in the United States, many older consumer businesses are looking to acquire budding companies, meaning B2C M&A activity “should remain strong as acquirers continue looking for businesses ready to cater to a stronger and growing consumer base,” the PitchBook report states. As China transitions to a consumption-based economy, businesses with footholds there are expected to be considered particularly valuable, according to the report. The health care sector was hot with 447 transactions worth just over $100 billion closed in the third quarter, the second-highest quarterly activity seen in more than two years. The median health care deal size came in at $86.4 million in the third quarter, nearly tripling the comparative $30.7 million median seen in the first quarter, according to the report. 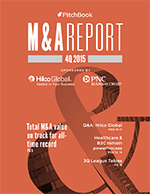 In all, 1,305 health care M&A deals worth more than $400 billion closed this year through the third quarter, according to PitchBook. Fueling the focus on the health care segment is a move toward vertical integration and consolidation, with providers seeking administrative and logistical efficiencies as health care model shifts from volume-based to value-based, the report found. Roll-ups of providers in such fragmented segments are continuing “unabated,” aimed at creating value in more efficient outpatient care and garnering potential long-term cost reductions, PitchBook reported. Information technology saw fluctuating deal volume over the past few quarters, though activity remained relatively high. Deals for IT companies totaled $41 billion over 707 transactions in the third quarter, compared with $39 billion for 779 deals in the first quarter, and $51 billion for 698 transactions in the second quarter. Carey Gillam is a business writer based outside Kansas City, Missouri.